It's very basic and something I only put together for myself, but I figure someone might have a use for it, I figure I have to start somewhere and I suppose here would be a good place. 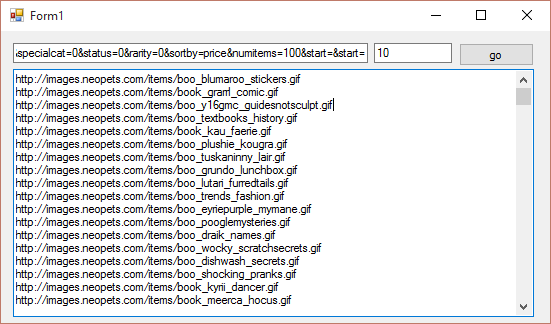 you paste the JN DB url, you remove the start value from the query string, the second input is an integer, it correlates to how many hundreds of items you want the image urls of, 10 = 1100 items (0 is one page, 1 is two pages) You can then paste the output straight into an adblock filter. changing the query to only a certain rarity or value you could even make a whitelist of images rather than a blacklist. There's no error validation, you've been warned. It's not much to look at but I guess a screenshot is better than nothing. This will be handy for me. Looks too be simple enough too use. Semi-Legit Restocking, 100% client side!